Providence, RI (2/3/2012): In honor of Zellio Toppazzini being elected into the AHL Hall of Fame, the RI Reds Heritage Society is making the month of February "Topper Month," with a special membership offer. 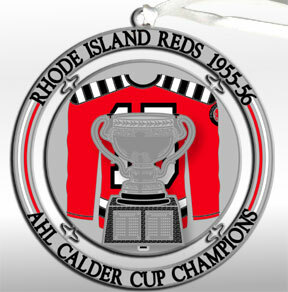 Each new member who joins the Rhode Island Reds Heritage Society by Feb. 29, 2012, will receive a Calder Cup Ornament from the 1955-56 Championship season. Topper played for the Reds that season and was the leading scorer of the AHL. For just $20 you will receive 3 newsletters, and invitations to our many events including the Annual Cookout. Call Buster Clegg at 401-247-2666 or dowlnload our membership form and mail it and your check to: Rhode Island Reds Heritage Society, P.O. Box 167 Barrington, RI 02806. Click here to get the membership form.